Game warden Mike Bowditch returns home one evening to find an alarming voice from the past on his answering machine: his father Jack, a hard drinking womanizer who makes his living poaching illegal game. An even more frightening call comes the next morning from the police: they are searching for the man who killed a beloved local cop the night before—and his father is their prime suspect. Jack has escaped from police custody, and only Mike believes that his tormented father might not be guilty. Now, alienated from the woman he loves, shunned by colleagues who have no sympathy for the suspected cop-killer, Mike must come to terms with his haunted past. He knows firsthand Jack's brutality, but is the man capable of murder? Desperate and alone, he strikes up an uneasy alliance with a retired warden pilot, and together the two men journey deep into the Maine wilderness in search of a runaway fugitive. But the only way for Mike to save his father is to find the real killer—which could mean putting everyone he loves in the line of fire. 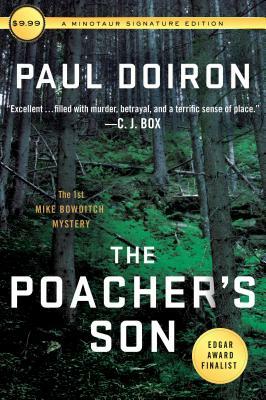 Paul Doiron's The Poacher's Son is a sterling debut of literary suspense. Taut and engrossing, it represents the first in a series featuring Mike Bowditch. A native of Maine, bestselling author PAUL DOIRON attended Yale University, where he graduated with a degree in English. The Poacher’s Son, the first book in the Mike Bowditch series, won the Barry award, the Strand award for best first novel, and has been nominated for the Edgar, Anthony, and Macavity awards in the same category. He is a Registered Maine Guide specializing in fly fishing and lives on a trout stream in coastal Maine with his wife, Kristen Lindquist.